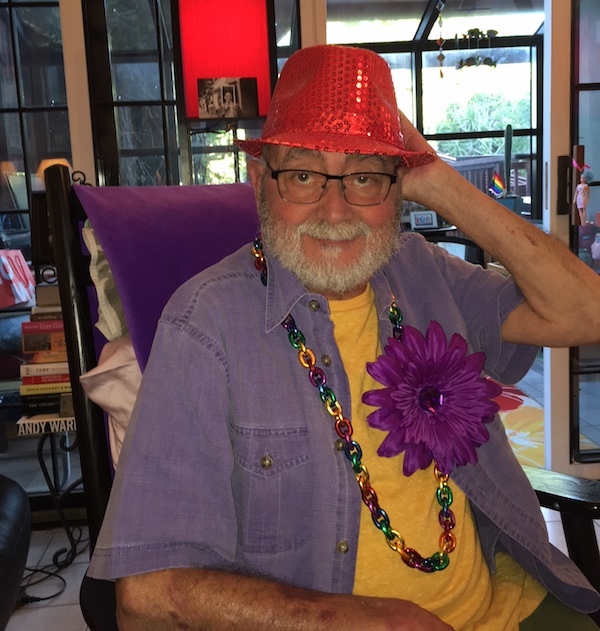 For the first time in the thirty-eight years since I moved to San Francisco in 1980, I didn’t attend the Pride Parade and Celebration here in June. My decision not to go was not based on any lack of pride—quite the contrary. I wanted desperately to go, particularly this year, as a sign of solidarity with my LGBTQ sisters and brothers as well as with immigrants, minorities, the elderly, and other marginalized people as we face off against the most draconian and downright hateful administration in my sixty-five-year lifetime. I wanted to be there to assert that not even the evil cabal in Washington, D.C., can diminish my pride in myself, in all of us long-term survivors, in all of us marginalized folks. But I simply couldn’t go. The deciding factor was my lack of mobility. As I’ve written here before, around the first of April of this year it became necessary for me to use a wheelchair whenever I leave the apartment. Although I’ve been chair-bound for three-and-a-half months now, I still am not strong enough (or skilled enough at aiming the damn thing) to maneuver the chair through a crowd of a million revelers. And there was no way I was going to ask my fiancé Rick to push me through that crowd along the Parade route or at the Civic Center celebration—he has been a real superhero when it comes to pushing me around town, but navigating Pride was just too great a chore for me to ask. Missing Pride this year was particularly dispiriting because, for the first time ever—after the “Dykes on Bikes” contingent, of course—the Parade was led by a contingent of LGBTQ seniors, including several long-term survivors whom I know. The contingent was organized by Openhouse, an organization that provides “housing, services, and community” for LGBTQ seniors in San Francisco. During their Pride planning this year, Openhouse created the “GenOut” logo to abbreviate the phrase “Generation Out,” my generation, the first generation who lived out and proud lives. I would have relished the opportunity to march (or, in my case, roll) with other members of GenOut in the Parade! I would have been so proud to lead off the Parade with my friends and other long-term survivors! One of the things I’ve realized in recent years is that being a long-term HIV survivor means dealing with a constant series of subtractions—of things taken away, destroyed, or put out of reach. The biggest and most difficult subtraction, of course, is the loss to AIDS of several friends. (I stopped counting how many friends I’d lost when the number reached thirty-six in 1989, before my thirty-sixth birthday.) Other subtractions have included the loss of my career (forced to go on SSDI in 1999), the loss of physical prowess and power (I was for years an accomplished wrestler; now, I cannot walk unassisted), and for many years the loss of any sense of belonging to a community because my serostatus marked me as “the Other.” The list of things that I simply cannot do, things that get subtracted from my life, seems to grow exponentially every year. And I have no reason to expect that to abate—I fully expect the rest of my life to bring more physical problems and, possibly, my biggest fear, dementia. Losing Pride this year was hurtful, but only minimally so by comparison. Just as in physics for every action there is an equal reaction, there have been some compensations for the losses I’ve endured. Yes, I’ve lost dozens of friends, but for the last seventeen years I’ve known the unlimited unconditional love of a generous, gentle, caring man. Also, recently, I’ve made dozens of new friends in the community of long-term survivors as we’ve all reached out to each other. Yes, I lost one career and for about thirty years lost my writer’s voice, but with Rick’s help I’ve regained that voice and A&U has given me a megaphone for it, and that has opened other creative opportunities for me. And as I regain some upper-body strength and learn how to aim the chair more accurately, who knows, my mobility and independence may improve. And maybe I won’t lose the shards that are left of my mind after all. The one thing I will never lose—will never allow to be subtracted from my life—is the pride I feel in our community. Even if I’m sitting at home again next year, dressed to the nines in my best Pride regalia, my spirit will be marching with you. Always.